Arrived back in Brisbane and made our way up to Bundaberg to visit the rum factory- boring fact- this was the 6th time we had travelled on this stretch of road due to going to the zoo, fraser island and back to sydney for new year! So we felt a factory full of rum was well deserved and needed by this point!! The factory was lots of fun and quite interesting- now pros on the rum process to add to our banana and other useless information we have learnt on this trip! 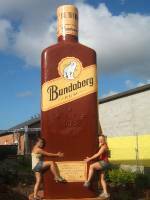 We now know that Bundaberg rum is one of the biggest manufacturers of alcohol in australia and is very popular all over the world. After a tour of the factory we were given free vouchers to sample all of bundabergs drinks. We decided to join forces and between us managed to try all 6 of the rums produced. Round hated every sip, leaving lots of extra sips for B and D! Our fav drink was the liquior which when mixed with cream tasted like baileys- yummy!